Ah, Roma. A city so decadent in history, yet rendered poor with the apathy of today’s peddlers. 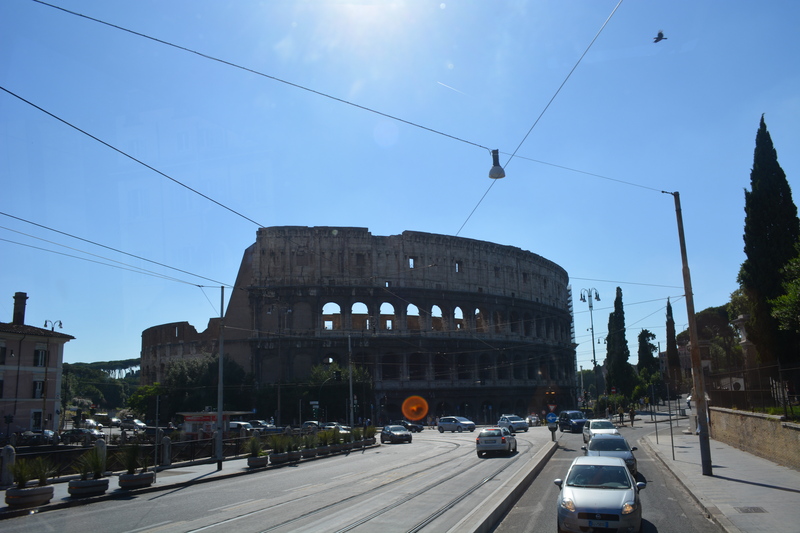 Our time in Rome had its ups and downs, to say the least; but Rome was a beautiful city and I just don’t think I had the chance to get to know it to its fullest extent. I’m sure I’ll go back someday — though now, I think I’ll travel to a few other paces on my bucket list first. So, okay, from the beginning. 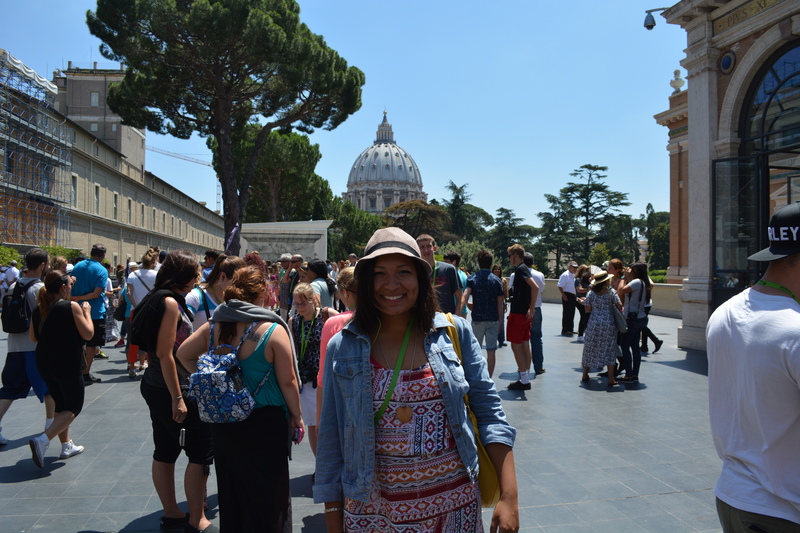 We left Florence in our usual style — bright and early — and headed straight to the Vatican. The ride was short, and most of us slept on our way there. When we got to Vatican City, all 45 of us got dropped off at a bus port in a few steps away from the entrance to the Vatican Museum. We met the guide who would be escorting us through the museum, and received our headphones for the walking tour she’d be narrating. Then, we stepped inside. Immediately, we knew that this was a bad day to visit the Vatican. Apparently, the next day was a holiday and the Vatican Museum was closing early. Consequently, everyone and their mother was at the Vatican to celebrate the holiday and get into the museum before it closed. Tourists from all over the world surrounded us as we embarked on our tour through the grounds. Our tour guide had to hold up a purple umbrella for use to see her above the other tourists’ heads. Inside the museum we could not see much of what lined the walls because there were so many people crowding the tiny hallways. We could at least see what was above, which were beautiful ceilings intricately composed with Christian paintings and sculptures. Though I could not see the majority of what we were walking through, I was still humbled by the pure fact that we were inside the most significant building in the Christian world. 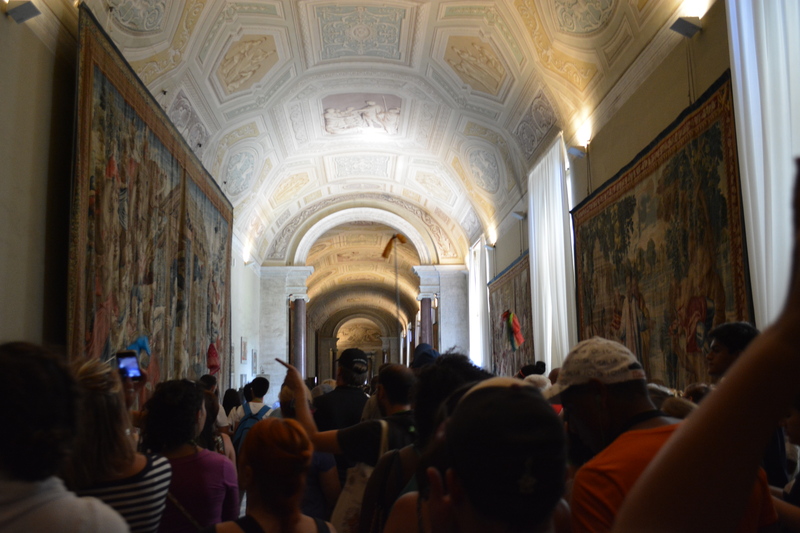 We ended our tour in the Sistine Chapel. Michelangelo, you do not disappoint. Talking was not permitted inside the chapel, which finally gave everyone the opportunity to peacefully soak in the beauty surrounding us. We stayed inside long enough to look at every panel of the Renaissance masterpiece, and then headed back outside into the square. A few of us had a quick glimpse into St. Peter’s Basilica, another humbling and surreal experience, but quickly had to rejoin the rest of our group and hop back on the Contiki bus. After leaving the Holy City, we took a quick driving tour around the Rome, passing the Colosseum, Palatino and Piazza Venezia Vittoriano. Rome is unlike any city I’ve ever seen. The city is speckled with Ancient ruins, yet has a Starbucks or Zara on every corner (okay, maybe not every corner, but you get the idea). Looking at the buildings whose heydays were nearly 2000 years ago (the Colosseum opened 80 A.D.), I could not believe that they were preserved for centuries. It was almost saddening to see people walk by these ruins with their headphones in, playing on their iPhones, completely desensitized to the history surrounding them. Our coach dropped us off for dinner in Piazza Novona, a beautiful city square on the site of the Stadium of Domitian. Knowing the restaurants along the Piazza would be pricey, a few friends and I ventured outside the plaza to find a nice quiet place to eat. 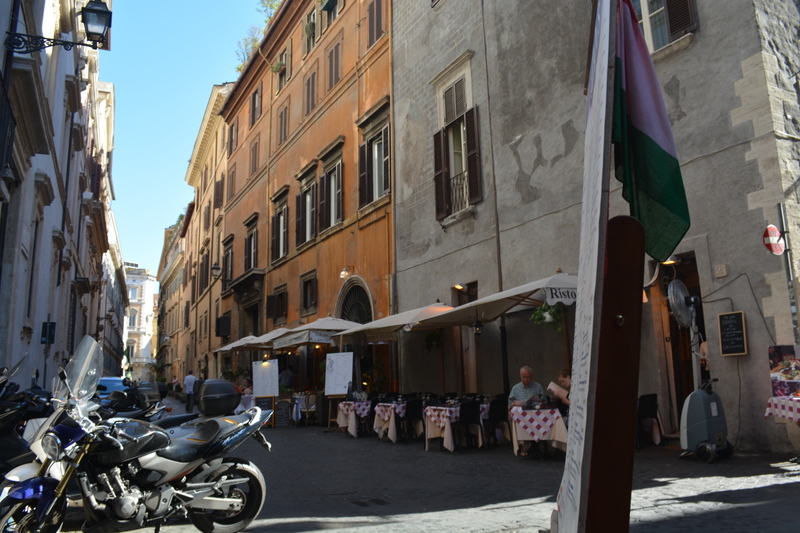 We settled on a cute little corner café with outdoor seating and friendly Italian waiters. Craving something somewhat healthy after days of engorging on pizza, I ordered a caprese salad. It was exquisite. Sitting at that corner café, enjoying Italian food and watching locals zoom by on their Vespas, I realized I had been pretty critical of Rome so far. 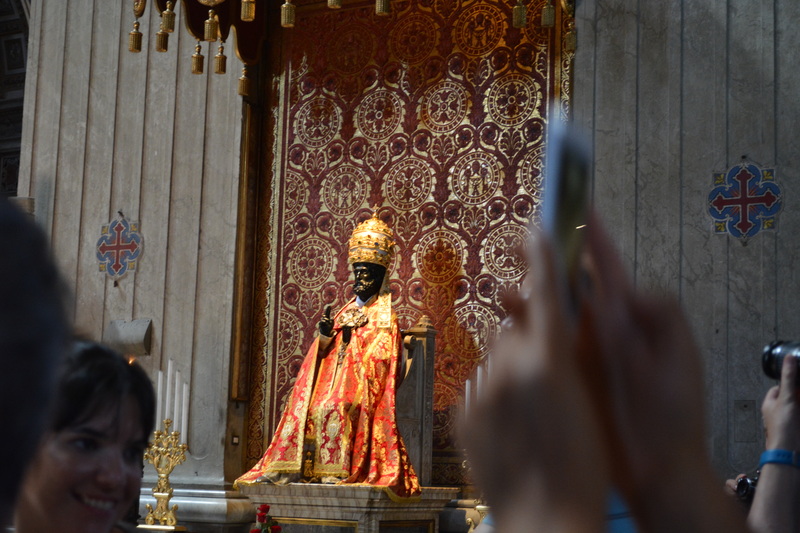 While some parts disappointed me, like the crowded Vatican and the complete modernization of the areas surrounding the ruins, I recognized I had set my expectations too high. I needed to forget about my preconceived notions of the city and just focus on what was in front of me. Rome is truly charming, with cobblestone streets and picturesque crème and preach-colored buildings that look exactly like the movies. There was beauty all around me, I just had to look through the bad stuff to find it. After dinner, we grabbed some gelato (of course), then hopped back on the coach and headed to our campsite. This was the last city on the Contiki tour, and our last time setting up camp together. Back at the site, my friend Sasha and I grabbed our iPads and went to the on-site bar for WiFi so that we could Skype with our friends and family back home. Though everyone else was drinking, it was a quiet and peaceful night for us and we got much-needed rest for our next day in Rome.